We get together for wine tasting once a month or so. There is usually a theme and we each bring a bottle and a dish to share. Late last year we had a Spanish wine evening and, because I was in a brief period between jobs, I had the time to research and select all the bottles for the evening. 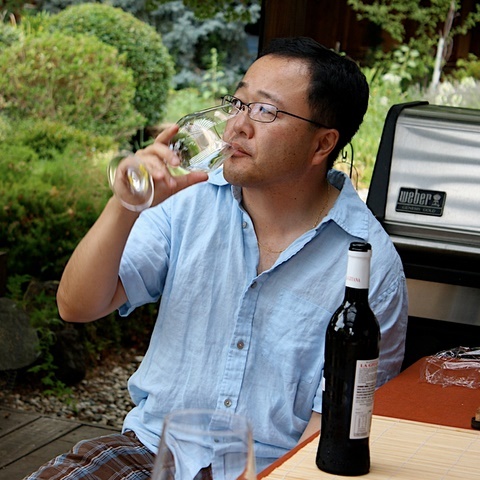 Since them, I have continued to taste the Spanish wines I can find in California. I think they are under appreciated here and decided to put together this post. At its worst, I think wines made of Tempranillo have a similar character as cheap Chianti wines you pick up from the bottom shelf in supermarkets. At its best, Rioja and Ribera del Duero wines made of Tempranillo are considered some of the best wines in the world. The line up for that night sampled the main wine regions and styles of Spanish wine: we had a Jerez Sherry, an Albariño, a pair of Riojas (wanted to compare a Crianza with a Reserve), a couple of Ribeira del Duero. I had a bottle of Cava and a couple of Priorats, which we saved for a later day. For food we had Marcona Almonds, Manchego cheese, Jamón Serrano, and several other dishes. 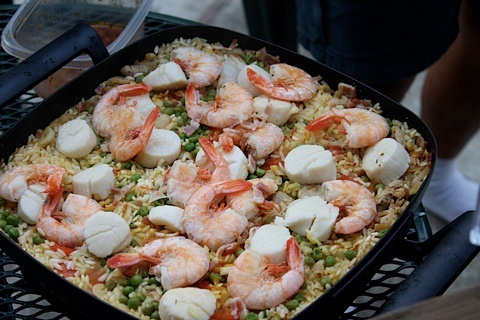 I also tried to cook a Paella (my Spanish friends said Scallops would be a very unusual ingredient). Spain is one the most traditional producers of wine in the world, with the largest planted area and third largest production of wine worldwide (behind Italy and France). Tempranillo, Albariño, Garnacha, Cariñena are some of the most common grapes. Rioja is the premier wine producing region, with Ribera del Duero and Priorat also producing great wines. The region of Jerez produce Sherry (fortified wine) and Catalonia produces Cava (sparkling). Rias Baixas produces white Albariños. Besides the use of the Tempranillo grape, Spanish wines are thought to be more “rustic” and employ more traditional wine making methods. Modernization of the industry happened later compared to other wine producing countries. 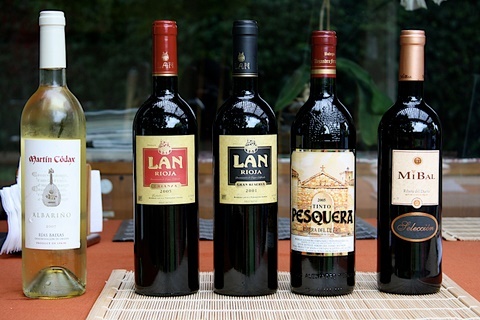 Spanish wines are often labeled by age. Crianza are young wines (aged 2 years, with at least 6 months in oak), Reserva (at least 3 years with one year in oak), Gran Reservas are produced only in above average vintages and require 5 years, with 3 years in oak. Not unusual for Spanish wines to be released only after 10+ years of aging. Rioja reds usually are made mostly with Tempranillo, with some blending of Garnacha, Graciano and Mazuelo grapes. Rioja was influenced by Boardeaux producers in the 17th century and uses oak barrels to age wine. Ribera del Duero is the second wine producing region, also using mostly Tempranillo grapes. Tinto Pesquera produces wines that are often among the top rated by wine experts. Priorat is less traditional (and sometimes more innovative) and uses Garnacha and Carineña grapes. Rias Baixas Produces the best whites from the Albariño grapes. I have been to Yosemite some 30 times and climbed Half Dome a dozen times since 1994. I have mountaineering experience and the information in this post is correct to my knowledge, but it is for you to use at your own risk. If you are planning to go there and have questions, feel free to contact me by leaving a comment below. Climbing Half Dome in one day is a very challenging and rewarding experience. There are amazing waterfalls along the way, the thrill of climbing the Half Dome boulder, and magnificent view of the entire Yosemite Valley from the top. For most people, it is the biggest hiking/climbing accomplishment to experience and there is some pain and suffering involved. It is not technical at all and doesn’t require previous experience or specialized equipment. Don’t “just decide” to climb Half Dome after arriving to Yosemite. Without basic preparation and good physical conditioning, a climb of Half Dome is more painful than rewarding. For most people, a Half Dome climb will happen from late Spring to early Fall. You want to check if the route is snow free and that the cables are up (they are usually installed after snow melts in May and removed in early in Oct). 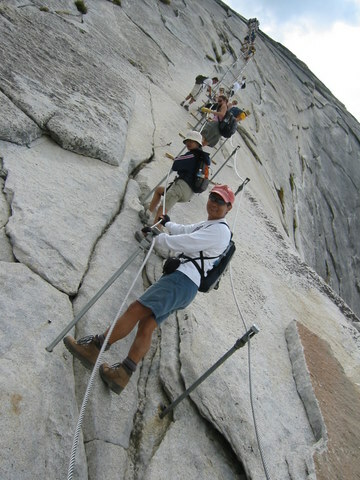 In the 2010 season, the park service implemented a requirement for an advance climbing permit. The gateway for information about park closures, permits, and official information can be found at the National Park Service website. Unless you are in reasonable physical condition, don’t plan to climb Half Dome all the way to the top. If you have never been to Yosemite before, I also do not recommend it (you will have to rush through some of the most amazing places in the planet). It is a long and strenuous hike and there are several more reasonable goals along the way (Top of Nevada or Vernal Falls, for example). The ideal group size for hiking/climbing is 3-6 people. Unless you know what you are doing, don’t do this alone. If you have a larger group, consider breaking it in smaller groups. Once you start, stay always in contact with your group. Half Dome is usually done in one long day. The total round-trip distance is 14-16 miles (depending on whether you take Mist or John Muir trail). The top of Half Dome sits at 8,842 ft with total elevation gain of 4,800 ft from the Yosemite Valley floor. To get to the trail head, you need to walk from the Curry Village day parking lot or take the shuttle. I recommend staying at Camp Curry and either walking or taking the very first shuttle of the day. You want to start from the trail head (Happy Isles) preferably before 7AM and never after 8:30AM or so. For an average well prepared small group doing it for the first time, it will be a 12-hour journey (my personal range has been 8-12 hours). You will be sore, tired and your knees will hurt at the end of the day. This is not a casual hike. So do not ignore the recommendation in this section. – Start with good hiking shoes. Make sure they are sturdy enough, have been broken in. . It is possible to do it with good cross-training shoes, but tennis shoes or sandals are just not appropriate. – You will need at the very least a full gallon of water and there is no potable water available for most of the way. My recommendation is to bring 4 1-litter bottles and reload them at the bottom of Vernal Falls both ways. I carry 6 liters. – It is usually very hot during the day. Dress in layers and bring lightweight fleece or wind breaker tops and bottoms in your pack. Wear a hat and plenty of sunblock. The sun will be on your back most of the time. – Bring food for the day. Don’t carry more weight than necessary. Nuts, bars, fruits, cheese, jerky are common choices. – Carry a flashlight, you might be hiking in the dark at the end of the day. If you don’t like to get wet, make sure your wind breaker has a hood and is water-resistant (for Misty Trail). – Bring a pair of gloves for the cables. Gardening gloves will work. – If you are in a group with me, I will be carrying extra water, a trail map, a first-aid kit, space blanket, emergency water purification tablets. Start from the Happy Isles trail head as early as reasonable (preferably before 7AM). Take group pictures in front of the sign with the distances to several destinations. We will be starting on the John Muir trail, which extends over Sierra Nevada all the way to Mt. Whitney. As you start the long hike, make sure your boots are comfortable. The right time to make adjustments is before, not after, you develop blisters. After about half hour, you will arrive at a footbridge. It is your first glimpse of Vernal Falls. Drink some water from the fountain and reload your bottles. This is also the last full-service bathroom. Continue on the trail and you will hit a fork. John Muir Trail continues to the right and Misty trail breaks to the left. You could reach Half Dome either way, but we will turn left and take Misty Trail (it is faster, shorter, more scenic). You will be climbing rocky steps next to the falls (if it is early summer, you will get wet). About 1 hour from start, you will be arriving at the top of Vernal Falls (the little dots on the photo above). Take a short break and appreciate the view. There is a composting bathroom at the Top of Vernal. Leaving Top of Vernal Falls, cross the foot bridge and take the trail towards Nevada Falls. 15 minutes later, you get a good view of Nevada Falls to the right of the trail. About 2 hours from start, you will be arriving at the top of Nevada Falls. Take a break. There is a composting bathroom (there are no other easy bathrooms above this one). We will save a visit to the waterfalls (quarter-mile to the right) for the way back. If it took much more than 2 hours or you feel tired, make the Top of Nevada Falls your destination for the day. This is about 2/5 of the total climb. Turn left towards Half Dome. Shortly above Nevada Falls, you will be walking in mostly flat terrain for a while. That is Little Yosemite Valley (there is a campground, which allows for a two-day climb of Half Dome). The trail starts to climb again through the forest. Enjoy the shade, as most of the last part of the climb will be exposed to the sun. This section of the climb is less visually dramatic, there are no waterfalls and big boulders. About 4 hours after the start, you will reach the treeline and have the first dramatic view of Half Dome. Notice the dark line going up the boulder, you will be shortly climbing that line. If it took much more than 4 hours to get here, it is already mid-afternoon, or you feel extremely tired, consider making this you return point. Shortly after crossing the tree line, you will reach what some call the “quarter dome”. It is a long section of steep rock steps. It might be useful to wear gloves so you can use your hands for balance. Over and above the steps, you will get a closer view of Half Dome and reach the beginning of the cables. Take a break. If it is late or you are afraid of heights, consider making this your point of return. The last section of the climb is done walking on the granite boulder slope with the help of a pair of cables working as hand rails. Do not climb if there are storm clouds around you and there is risk of lightning strikes. This may be psychologically challenging (specially on the way down), but it is not particularly difficult or dangerous. I enjoy the view, but if you are not comfortable with heights, just focus your attention to the cables and your steps. The biggest problem you may find is traffic congestion. It is not uncommon for hikers to get stuck along the way. Be prepared to hang to the cables for up to 45 minutes waiting for the line of climbers to move. Ok, you’ve made it. Now is time to descend back. 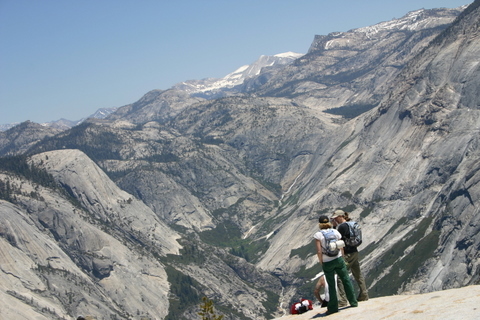 From the top of Half Dome you get amazing views of the Valley and dramatic vertical drops. Enjoy your accomplishment and rest for a while before starting the descend. Most climbing injuries happen on the way down, so use caution. Adjust your boots (you want them to be snug to keep your toes from jamming). If it took you about 6 hours to reach the top, it will probably take about 4 hours down. When you reach the bathrooms at the top of Nevada Falls, if you have time and energy, the waterfalls (1/4 mile) are well worth a visit. From top of Nevada, there are two alternative routes. 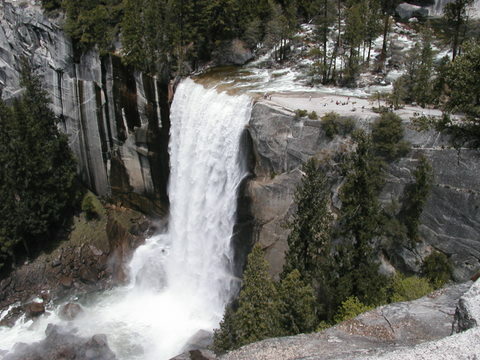 The first alternative is to return the same way up (down from the bathrooms to Vernal Falls and Misty Trail). This is my strong preference and recommendation. 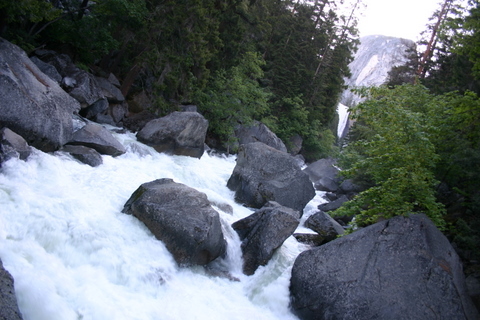 The alternative is to cross the bridge at the top of Nevada Falls and go down through John Muir trail. This adds about one mile to the journey, but the descend is more gradual. The reason why some people will recommend that is that by them your knees will be hurting and the gradual slope would be gentler. I think it is just extending the pain and suffering. Congratulations! You have climbed Half Dome. Hopefully, you made it to Happy Isles before sunset and before the last shuttle bus. If not, you have another mile to walk in the dark and restaurants will be closed by the time to get back to camp. So I was born in Brazil and have lived in California for more than 20 years. I am often asked about travel in Brazil by my American friends. This post is meant to collect helpful information. How many days I need to visit Brazil? Where to go? Most people find surprising to learn that Brazil is larger than the continental US. So there is no way to “visit Brazil” in a few days of vacation. Because the flight from one of the US hubs (Dallas, Houston, Miami, …) to São Paulo or Rio is about 12hours, it is reasonable to plan at least a week to go anywhere in Brazil. Most business visitors go to São Paulo. It is a cosmopolitan very large city. At its best, it feels like New York. At its worst, it can be feel like the worst in New York. Other than business, São Paulo has world-class gastronomy, culture and nightlife. Traffic is really bad. Most tourists go to Rio. It is a large city with the problems of a large city (including crime and the shanty towns – “favelas”). But it is a beautiful place (world-famous beaches – Copacabana, Ipanema and landmarks – like the Corcovado and SugarLoaf). It is your choice to focus on the good or on the bad. The capital cities along the Northeast coast combine beautiful beaches, a slower pace of life, historical landmarks, and a unique cultural experience. The North of Brazil is dominated by the Amazon rainforest. 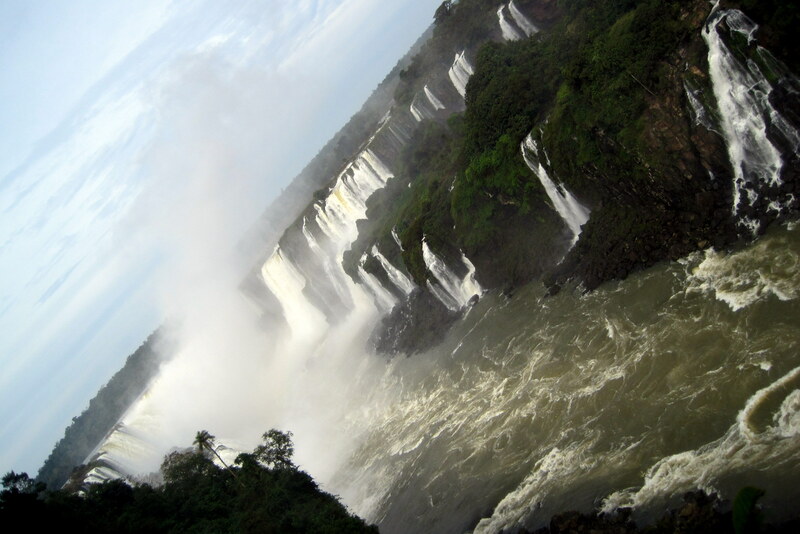 In the South, there are the majestic waterfalls of Foz do Iguaçú. From a personal safety perspective, if you have traveled internationally before and/or have some common sense, not particularly. But if you wear Tevas and Flower shirts, have a camera around your neck and a Panama hat on your head and decide to walk around one of the large cities pointing at buildings, you will probably be mugged within the first 15 minutes. From a health perspective, you will survive fine in any of the cities along the coast doing the same you do at home. If you plan to spend a week going down some remote Amazon river and visit a remote place deep in the jungle, you may want to ask your health care provider about recommended vaccinations. So, relax. Your are on vacation. Brazil is in South America. Being in the South Hemisphere, the seasons are reversed compared to the US (i.e. Christmas trees are set during summer and July is winter). Most of the large cities in Brazil are 1 hour ahead of US EST during the US summer (i.e. noon in New York is 1PM in São Paulo) and 3 hours ahead during the US winter (daylight saving times are reversed as well). There are no Earthquakes, Hurricanes, Snow, or any extremes in weather in Brazil. In the South and Southeast, winters are mild (temperatures don’t go below freezing). In the North/Northeast, it is always summer (but high temperatures rarely go above about 90F). 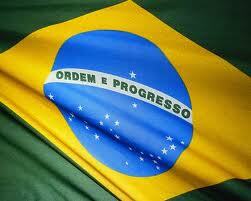 Brazil is the Latin American exception colonized by the Portuguese (your Spanish vocabulary may help, but not much). The population is about 200 million. Brazil is a direct democracy. The president is elected directly every 4 years (as of 2015, the president is Dilma Rouseff and Brazil is in the midst of a political crisis). The country is divided into 26 states. Ethnically, Brazil is a mix of the Portuguese colonizers, African slaves, and mostly Italian, Japanese, German immigrants from the early 20th Century. The South has mostly European (Italian, German) influence. The biggest cities are in the Southeast: São Paulo (where you go for business, Italian, Japanese influence) and Rio de Janeiro (Portuguese, African). The Northeast has a slower pace and a beach lifestyle, with mostly African influence. The Midwest is dominated by the “Pantanal” wetlands and the North Amazon rain forest have relatively low population density. Brazilians are generally perceived as friendly, welcoming and warm. They will go out of their way to make sure you’re happy in their country. But don’t expect people from a large city like São Paulo to be very different from New Yorkers. Most Brazilians dress casual, but not sloppy. They are fashion-aware. Don’t wear shorts and flower shirts in the city unless you want to stand up as a tourist. The business culture is close enough to American. So, if you dress and behave like you do at home (unless you are from California, in which case step up a notch), you will be fine. Most Brazilians are Roman Catholic. Soccer is, by far, the most popular sport. Formula One racing is popular as well. Brazil usually does well in team sports (basketball, volleyball, etc). The Brazilian currency is the Real (R$). As of 2015, thinghs are shaky in the economy and US$1 = R$4. The country is on sale. Generally, Brazil will feel inexpensive to an average American visitor. Imported articles will cost about the same as in the US (shopping mall, McDonald’s, fashionable clothing, etc). Basic necessities and services (food, taxi rides, local products, mid-range hotels, etc) will be about half of what you are used to. Credit cards work in large cities, shopping malls and high-end restaurants, but you probably want to carry local currency. The best way to get local currency is to use your ATM card (not all ATM machines will take your US card, so you need to look for the network logos). Nobody will complain if you tip above the nominal fee, but most restaurant checks already include a 10% service charge and it is not necessary to tip taxi drivers. For other tourist services (hotel, tour guides, etc), you can do as you would at home and you will make people happy. Driving is similar to the US. Exception: No right turn on red. Generally, driving in Brazil is a lot more aggressive than in the US. It is easier and cheaper to get a taxi, don’t rent a car unless you know what you are doing. US Americans need a Visa to visit Brazil. There is a reciprocity policy, so you will be treated similarly to how the US embassy treat Brazilians (expensive fees, slow service). It is a nuisance, but nothing out of the ordinary. Food is not to be experienced as a comparison, but compared to the US, Brazilian food will be generally saltier and less spicy. It will change depending on where you are, but is is not exactly “exotic”. You will probably try fruits that are fresher and more diverse than you have ever seen anywhere else. The “typical” food will be “Feijoada” (black beans and pork stew, served with a variety of side dishes) and “Churrasco” (cuts of meat, mostly beef, served Gaucho-style). The everyday home food for most of Brazilians is rice, beans, beef, green salad. 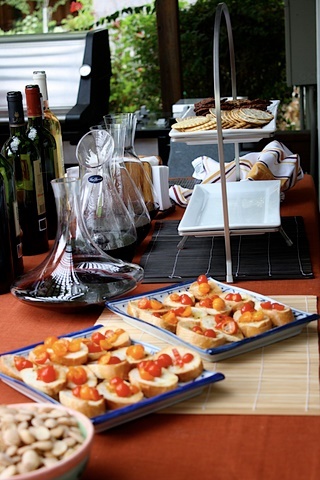 In the South, food will have strong European (Italian, German) influence. Beef is good and plentiful. São Paulo is the food capital. Cosmopolitan, with word class Italian and Japanese. In the Northeast, you will find spicier food, more seafood and cassava (yucca) or maize as the staple starch. Table etiquette is not very different to what you are used to. People use fork and knife to eat pizza. Otherwise, behave as you do at home and you will be fine. There is not a big wine tradition in Brazil. Most people drink beer (usually, not very memorable Pilsen). The national liquor is “Cachaça”, made of sugar cane, similar to rum. Order a “Caipirinha” (mix of Cachaça, lime and sugar). Rio de Janeiro. 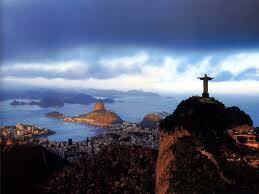 Worldclass beaches (Copacabana, Ipanema) and landmarks (Corcovado, Sugar Loaf). Northeast. Capitals along the Coast. Salvador and Recife are the most popular. Lots of colonial history, African influences, slow pace of life, beach life. São Paulo. Large cosmopolitan city. Business, Gastronomy, Nightlife. Foz do Iguaçú. Big waterfalls. Pantanal. Wetlands in the mid-west, with a very large fauna variety. This post contains my personal notes from attending CRM Evolve 2010 in New York City earlier this week. I hope it is useful beyond documenting my views, to people who were not able to attend in person. My perspective and bias is of someone who is with a Social Business Software vendor, with a long history in “Social” but relatively new to the CRM industry (I was previously developing and selling enterprise IT software and hardware). I was almost all the time in the conference room dedicated to the Social CRM track and monitoring the Twitter #SCRME10 hashtag. This was a very valuable event for me and the quality of speakers and session content was very high. There three tracks: CRM Strategies, Social CRM, Deployment. The sessions in the Social CRM track were well attended (maybe 50 people in average, with about half of them being vendors and consultants, and half being CRM users). The users I met tended to be from relatively large organizations and their goal was to understand how “social” was going to affect their deployments. From the CRM vendor community, the “big 4” presences were SAP, Oracle, Microsoft and RightNow (with the noted absence of SalesForce.com). There were a significant number of small startups navigating the conference and at the show floor. The separation between “CRM” and “Social CRM” was very clear. The incumbent vendors are dancing around and very cautious about talking social (though they are moving in that direction), while the “social” track is dominated by analysts supported by (or supporting) small startups. I believe that needs to change (more on that below). I greatly enjoyed the opportunity to meet many people I had only seen through 140-character posts. It was great fun trying to match the thumbnail photos (and their online persona) to real people (and the way they articulate their ideas in person). I bet you would find that person-to-person interaction was the greatest value of attending the conference for all attendees. Conferences nowadays is about meeting peers, experts and customers face-to-face, not about accessing content that can be delivered through other media. I did retweet the announcement that the attendance of CRME10 was larger than last’ year’s, but it is clear to me that conferences have to evolve their format and business model to adapt to new realities (which, I know, is easier to say than to do), including this one. While just a detail, the fact that the conference bags full of brochures were stuffing the hotel garbage containers before the keynote presentations were finished was a telling symptom. CRM Evolve was a great and successful event, but one can always give suggestions for next year… Medium: less paper and podiums, more interaction. Perspective: More voice of customer, less voice of vendors and analysts. Content: more case studies (like drugstore.com, a big hit), less competing terminology and frameworks. Attitude: more openess, better integration with online. The level of resonance was very high and there is clearly convergence of thinking among vendors, analysts and consultants focused on Social CRM. I believe it is now time to invite, include, and listen to the user community, traditional CRM vendors, international perspectives, competing groups (social business, enterprise 2.0, etc). If we truly believe the world is shifting towards less control of the conversation by the experts, we as a community need to put that to practice by including and accepting diverse perspectives. Have we over-hyped the Social in “Social CRM”? Yes, we have. I think that is a natural market dynamic to create a critical mass of awareness and a basic framework of ideas and terminology. For more thoughts on that, see The Future is not Tomorrow. Some of my favorites, notes, ideas and quotes from 3 days of meetings. “Customer Service is the new Public Relations”. This came up a few times in several sessions (including but not limited to Emily Yellin keynote, Dr. Natalie’s session, Drugstore.com). Companies need to realize that shouting to customers before the sale and talking to them after the sale is no longer an appropriate segmentation. Creating a satisfying customer experience and increasing business will depend on both integrating the PR and CS efforts and engaging with customers from the beginning of the relationship. “Down with Organization Silos”. Was also a recurring theme. Marketing and Sales need to work together. Customer Service is the new Public Relations is the new Technical Support is the new Marketing. “The digital medium is global”. Esteban talked about how market interaction has to go from “multi-channel” (i.e. engagement through a diverse mix of media) to “cross-channel” (i.e. being able, for example, to start a conversation on Twitter and seamless move to the phone and going back to e-mail without losing context). Jesus Hoyos highlighted local factors to consider when deploying CRM solutions. In the digital medium, companies cannot segment their channels based on their geographical organizations. As said before. This is a small but telling detail of how the business model for conferences has also to adapt to a more digital world. There is not point in having a shouting department and a listening department. It should be called “Customer Engagement department”. The mission of Airlines is NOT flying planes. It is moving customers from point A to B, make them happy and keep them happy. @mfauscette. Not necessarily new, but it was a great response in the context of the presentation and the question asked by an attendee (who was arguing for the efficiency of segmentation and specialization and dismissing the holistic aspect of business). I think that applies to ourselves as a community as well as the people we are trying to influence or sell to. This was one of the few topics where my personal opinion is opposite to what seemed to be the general consensus. I was surprised by the focus on analytics by vendors, analysts and the apparent agreement from users. Is Social CRM under- or over-hyped? @mjayliebs. I responded to that question with “over-hyped”, to which Mitch said: to execute social crm, we need to get people excited about the value it provides #scrm excitement. | agree, but I think we are done with that. Great to meet Mitch Lieberman in person. A quote by the creator of legendary GoldMine CRM, it was a pleasure to meet him. I think the pendulum is moving towards business-as-it-used-to-be. In the past decades we went too far into segmentation (shouting versus listening departments, these people help customers those people take the most they can from customers). The good thing is that the shift towards “social” is easy. What drives you is not your MBO, it is just doing good and being honest. The presenter from Oracle started his presentation by saying “I am sorry, but I have a plane to catch and I will need to end this session in 10 minutes”. I was waiting him to add “but, you presence here is very important to us”. To be fair, he stayed for about 20 minutes and delivered a few good ideas. That sums up several recurrent ideas in the conference. I had a good time in NYC and I think this was a great event.